One of the most prevalent trappings of fantasy MMOs is that several classes and archetypes tend to be the same across every game. As far as classes go, it’s always made up of your Warrior/Fighter, Cleric/Priest, Assassin/Rogue, Mage/Wizard with these classes forming the legendary “Holy Trinity” of an MMO party: The Tank, the Healer and the DPS. 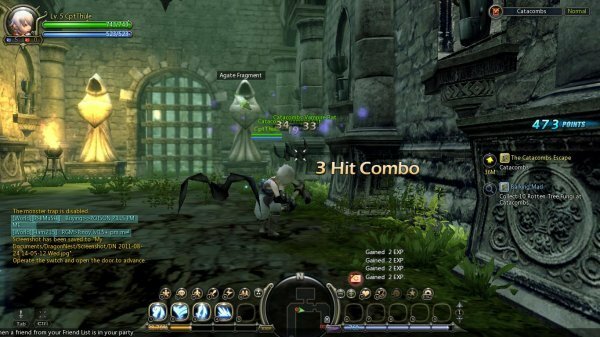 Occasionally, games come along that continue to be fun despite using a familiar template, and even in its open-beta phase, Dragon Nest proves it can feel familiar yet fun at the same time. The Swordsman: Swordsmen are warriors who favour the offensive aspect of their class. Players can choose to specialize in 1 on 1 or to improve their crowd control capabilities. The Mercenary: Mercenaries are the archetypal Tank that can be found in all MMOs. Though they tend to lose out when it comes to damage output, they are able to take a beating and ask for seconds. The Archer: Straightforward long-ranged damage dealer, the archer is fast, hard-hitting but fragile. Archers will need to use their mobility to ensure survival. The Archer can advance to a SharpShooter or an Acrobat. The Sharpshooter: Specialized in long-ranged combat, the Sharpshooter is the archer with a focus on long-range damage, but they are extremely fragile. She has one of the highest damage output in the game, which makes her an extremely valuable asset in any mission but her fragility discourages solo play. The Acrobat: The Acrobat is an agility and mobility powerhouse that trades in the bow for close combat damage dealing. The Cleric: Tank, healer and buffer, the cleric boasts a range of buffs and AOE attacks to support the party. The Paladin: Though low in DPS, the Paladin is a spell casting tank with a plethora of debuffs and buffs. The Priest: She is the support Powerhouse of Dragon nest, with the largest arsenal of support spells while still being able to hold her own against incoming threats. She is highly sought after for higher levelled missions. The Sorceress: Short to medium range spell caster, the Sorceress’ focus is a mix of damage-dealing attacks, status and crowd control abilities. The Mystic: A more balanced alternative to the elementalist, the Mystic’s main focus is crowd control rather than damage, using gravity to throw enemies around like rags. It’s no secret that modern MMOs have devolved into slow and repetitive “click on enemy til it dies” grind, I went into Dragon Nest expecting the same but I was genuinely shocked and surprised at the innovative gameplay elements is rarely seen in an MMO. The magic word here is “action”, DN does away with the traditional click and wait combat system of the old and replaces it with a more action orientated combat which puts skill and manual dexterity before anything else. The combat system consists of a reticule and that would be where your attack would land, much like a 3rd person shooter; but unlike a 3rd person shooter, most melee attacks attack in an arc to increase the chances of a hit. Standard and Alternate attacks are mapped to the left and right mouse buttons, while special attacks, items, and spells are mapped to the number keys. The game also has a combo counter which you are supposed to string together long combos much like what fighting games have been doing for the past 10 years, so it's really fun to try and do a different combination of skills to see what you can come up with. The game also features lots of achievements, so there’s plenty to do. The game world is split into various zones, connected by portals. While a little disorienting at times, you'll come to get used to how segmented the world is. Quests themselves are well written, with actual quest lines instead of the generic fetch quest. Combat is limited to instanced areas connected to the player towns, so some players will miss the exploration and feeling of being in one giant world, however, those interested in jumping right into a level and tearing baddies up will find this much more accessible. The instanced areas replacing the open fields are a good edition to the genre as a whole as it reduces the chances of kills and loot stealing. Each dungeon is structured like a mission, with a main objective and different difficulty levels affecting the rarity of loot you’d receive. The missions themselves are pretty straightforward; there are several interconnecting rooms, kill everyone in it to proceed. They usually culminate in a boss fight in the final room. Once completed, the game would give you a ranking depending on your performance and an item. Dragon Nest, while in need of a few tweaks, is a really fun and good looking game. Anybody that wants a little more action in their fantasy MMOs would do well to give it a try and see what it has to offer. The game's now in open beta so the fact that this game's already in as good of shape as it is, is a great sign that it has nowhere to go but up.